Ryokans are traditional Japanese-style hotels ranging from small family-run establishments to 5star deluxe properties that are located throughout Japan, but mostly in and around many of Japan’s hot spring resorts (Onsens). In order to accommodate overseas visitors that may prefer an element of western-style comfort, many ryokans now offer guests the option of western-style beds or traditional Japanese-style futon (a thin mattress placed directly on top of the tatami mats). Unlike western-style hotels, accommodation at a ryokan is normally on a half board basis (breakfast and dinner included) with the two meals usually served in the comfort of your own room. Staying at a ryokan offers visitors to Japan a wonderful and unique opportunity to really appreciate true Japanese hospitality at its best. The following is the kind of service you can expect from your ‘ryokan experience’. At many of the higher grade ryokans, the staff will be waiting to welcome guests at the entrance. 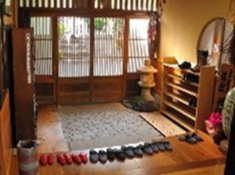 When you arrive, it is customary to remove your shoes at the entrance and put on the slippers that are provided.